The Bridge Hotel on the a40, 9 miles from Heathrow Airport and 3 miles from Wembley, is ideal for business or pleasure. This recently-refurbished hotel has 68 modern en-suite bedrooms, conference and banqueting facilities and a traditional Youngs pub. The restaurant also offers a wide range of dishes to cater for every taste. Our business guests can benefit from modem points in all the rooms. Fax and photocopying facilities are also available via reception and we have conference and meeting rooms available for hire. The hotel is ideally situated for major tourist attractions including Wembley and central London and for travel routes including Heathrow. We are just a few minutes walk from Greenford Underground station (Central Line) and 20 minutes by rail from central London. Only 7 minutes' walk from Canary Wharf London Underground Station and just minutes from the O2 Arena, the hotel offers great value, with comfortable air-conditioned rooms and a restaurant and bar. The Ibis London Docklands has a convenient location, with easy access to London's public transport network. The hotel is just across the road from Blackwall Station on the Docklands Light Railway (DLR). The ExCeL Exhibition Centre and London City Airport are just 10 minutes away via the DLR. The O2 Arena is just 15 minutes away by London Underground or via the DLR. Westminster, Oxford Circus and Piccadilly Circus are just 20 minutes away by London Underground. All of the en suite rooms have TVs with pay-per-view movies. Internet access is available at an additional cost. There is a cafe-style restaurant. The bar/reception is open 24 hours a day and offers hot snacks and drinks around the clock. Enclosed outdoor parking is available at an additional cost. The Sanctuary House is a fine, refurbished hotel with modern facilities in one of London's oldest and most fashionable areas. It is a short walk from Westminster Abbey and Houses of Parliament. The Fuller's pub on the ground floor is traditional, smart and modern. The food is home-cooked and Fuller's full range of fine wines and award-winning ales are on offer. 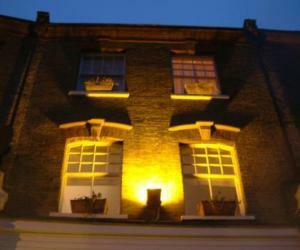 The Sanctuary House is a 10-minute stroll from St James Park, with The Mall and St James Palace. Oxford and Regent streets are about a mile away. The bedrooms are finished with cosy, comfortable amenities and a truly Victorian style. This central, refurbished budget hotel is a 5-minute walk from Paddington Station/Heathrow Express. A 5-minute walk will bring you to Hyde Park, Oxford Street, Portobello Market and Notting Hill. The hotel is newly refurbished and offers clean, comfortable rooms. Madame Tussauds, the London Eye and Big Ben are a few Tube stops away. Please note the hotel has no lift. Just a few minutes' walk from Earl's Court London Underground Station, in the heart of Kensington and Chelsea, the Manor Hotel offers a good location and great-value rates. The Manor Hotel is close to come of London's best-known attractions, including Kensington Gardens and Hyde Park. The shops of Kensington High Street are just 700 metres away and Westfield Shopping Centre is only 2 miles (3.2 km) away. Earl's Court London Underground Station is just metres away, offering easy access to the London Underground network, for travel all around the capital. The area surrounding the hotel has plenty of restaurants, cafes, bars and pubs. The hotel offers a range of accommodation to suit the needs and budget of any traveller. Some rooms have en suite bathrooms and rooms without en suite bathrooms are also available. All rooms are centrally heated and have tea/coffee making facilities, toiletries and telephones with voicemail. Situated in the heart of London, Castleton Hotel is an elegant 19th-century building adjacent to Hyde Park, just a 3-minute walk to Paddington station and the 15-minute Heathrow Express service. The hotel's comfortable rooms all have satellite TV and an en suite bathroom, while an inclusive full English breakfast is served in the restaurant each morning. Castleton Hotel is in close proximity to the main shopping areas of Oxford Street, Regent Street and Bond Street. The hotel is located on a tranquil street in London's Paddington/Lancaster Gate. Complimentary internet access is available in the reception area. Convenient for Oval Cricket Ground, this bright, clean and homely hotel is well-located for Waterloo Station and Victoria Station, and is walking distance from Oval Tube Station. 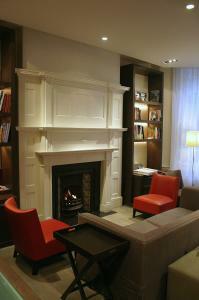 Belgrave Hotel offers great value for money in a Central London location. The hotel is comfortable and has friendly staff who are happy to assist. Oval Underground Station (Northern Line) is 2 short stops from Waterloo Station. A few short stops can bring you to Leicester Square and Piccadilly Circus, for shopping and entertainment. A brand new refurbished property right in the centre of town, a short walk from Baker Street, Oxford Street, Paddington station and, just around the corner, the Heathrow Express. The hotel's air conditioned rooms are fully equipped with modern, convenient amenities, including private showers or bathrooms. Tastefully muted shades make for a relaxing atmosphere. Hotel 82 firmly believe you will find their staff extremely service orientated and welcoming. Close to Victoria Station, Central House Hotel is a Georgian town house offering good value accommodation and free Wi-Fi. Tube stations are a brief walk away. The contemporary en suite rooms feature a TV and comfortable beds. An inclusive continental breakfast is served in the dining room. Guests may use the computer in the comfortable lounge area. There is a 24-hour reception at Central House Hotel. There is excellent access to the Gatwick Express 30-minute airport service at Victoria rail station. 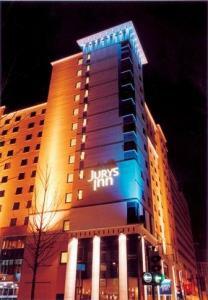 Jurys Inn Croydon is a hassle-free hotel a 20-minute train journey from Central London. Rooms are spacious and comfy, and there is a restaurant, a caf? and a bar. Located in the heart of Croydon, South London, the hotel is convenient for Gatwick Airport and businesses in Croydon. Good public transport is nearby. The large rooms are good value and some can accommodate up to 3 adults or 2 adults and 2 children. 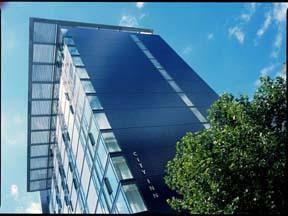 Near the South Bank of the River Thames, close to Shakespeares Globe Theatre, Tate Modern and the London Dungeon, this Novotel has a rooftop leisure and fitness suite. 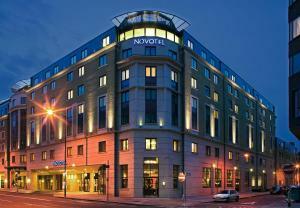 The hotel is within walking distance of the London Eye and St. Pauls Cathedral. London Bridge Station is 700 metres away, for easy Tube access to the West End and many other attractions. The stylish bedrooms at the Novotel London City South feature satellite TV, air cooling, high-speed internet, sound proofing and double glazing. The Elements restaurant serves international cuisine, with 24-hour ? la carte room service available. The Clinks Bar has areas for working and relaxing, with vibrant decor and Wi-Fi access. The rooftop leisure and fitness suite is only for guests, offering a gym, sauna and steam room. Up to 2 children (under 16 years) can stay free (with breakfast) when sharing a room with adults. This includes access to video games, baby equipment and a healthy children's menu. Families also get late check-out on Sundays (until 17:00). In the centre of London's West End, on the corner of Oxford Street and Park Lane, overlooking Hyde Park, this 5-star hotel boasts luxurious air-conditioned rooms and an indoor pool. Once a stately apartment building, the London Marriott Hotel Park Lane has a magnificent location, looking out over Marble Arch and Hyde Park. The hotel is close to all of the citys most famous attractions, theatres and shops. Marble Arch London Underground Station is just metres way and offers easy access to any part of the city. Stylish and elegant, with the atmosphere of an intimate boutique hotel, the superbly appointed rooms each boast luxurious new cotton bedding, LCD flat-screen TVs with satellite channels, laptop safes and work desks. Offering modern British cuisine and international favourites, the 140 Park Lane restaurant has an open kitchen, where diners can enjoy watching the chefs at work. The hotel also boasts a well-equipped fitness centre and a 12-metre heated swimming pool. Superbly situated in the heart of Marylebone Village, La Suite offers contemporary hotel luxury apartments with stylish interiors, a 5-minute walk from Baker Street Underground Station. La Suite offers a range of Studio Suites or Executive suites, which include a separate sleeping area and work space. Each of the suites has a kitchenette and a mini office, with facilities including a fax machine, printer, computer, free broadband access. The Studio Suites boast a Hydroshower, while the Executive Suites have a relaxing Jacuzzi bath. Each suite has and LCD TV, DVD player and luxurious Elemis products. Conveniently, La Suite apartments are a short taxi ride from Victoria and Paddington train stations, providing excellent access to Gatwick and Heathrow Airports' express services. Regent's Park and Madame Tussaud's are a short walk away. A complimentary continental breakfast is delivered to the suite every morning. Close to Blackheath and Greenwich, this small boutique guest house offers stylish and modern rooms, free Wi-Fi and easy access to Central London, the O2 Arena and the Excel Centre. Onesixtwo is a beautifully furnished, high-quality London town house. All rooms have amazing beds with Egyptian cotton bedding and flat-screen TVs with DVD players. In the morning, you can enjoy a high-quality continental breakfast. Docklands Light Railway (DLR) and the Jubilee Line of the London Underground are close to Onesixtwo. 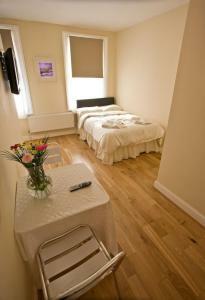 The guest house is also within easy reach of the A2 and London's airports. Free local parking is available. This friendly, small and central hotel in London's Bayswater district has an international atmosphere, and is walking distance from Hyde Park and Kensington Gardens. Brunel Hotel has a 24-hour reception, and helpful staff can assist with sight-seeing information, theatre bookings, laundry and fax facilities. The air-conditioned lobby and dining room are ideal areas for informal meetings (on request). The town house is close to Bayswater Underground Station, and Paddington Train Station with the Heathrow Express service. Located in the centre of London's fashionable Kensington and Chelsea, this hotel is within walking distance of the city's parks and museums. Ambassadors Hotel is close to Earl's Court and Olympia exhibition centres. A short distance away is the world-famous Harrods, Oxford Street and Regent Street. Gloucester Road and Earl's Court Tube stations are a few minutes' walk from the hotel. Following a major refurbishment, the newly redecorated rooms are bright and airy, with an en suite bathroom, a hairdryer, a colour TV and a telephone. Conveniently situated just 2 minutes' walk from Earl's Court Exhibition Centre and Earl's Court Tube station, Warwick House offers you an ideal central London location on a distinguished road. Warwick House offers studio apartments with private shower and kitchenette. Attractions within walking distance include Hyde Park, Harrods and the Olympia Exhibition Centre. This property is located just off the A4, enabling you to easily reach Heathrow Airport by car. 17 self catering apartments are suitable for single, couple, family or group bookings, whilst also catering for business group or single bookings. All studio apartments are bright and airy, with large windows overlooking a nice view. Other features of the property include a 24-hour reception . A haven of calm within a 7-square-metre space, this unique Japanese-style hotel provides cosy, budget accommodation inside Heathrow's Terminal 4, just moments walk from check-in and arrivals. Also within easy reach of Heathrow's other terminals, Yotel is ideal for airport rejuvenating stop-overs or short stays in the area. Each room offers luxury bedding ; a rejuvenating 'monsoon rain' showers ; relaxing mood lighting; a flat-screen TV; jukebox; bespoke toiletries; towels; and a work station with free Wi-Fi internet access. Yotel provides everything you would expect from a luxury hotel in a small space - you can sleep, work, relax, be entertained and refreshed. In the London borough of Hammersmith and Fulham, the Royal Guest House offers good-value accommodation in a convenient location with good access to all that the capital has to offer. Situated along the Shepherds Bush Road and within walking distance of King Street, Hammersmith Broadway, Brook Green and Goldhawk Road, the guest house is a convenient base for visiting Hammersmith Carling Apollo, Shepherds Bush Empire, Olympia Grand and the exhibition halls, Charing Cross Hospital, BBC Television Centre and Kensington High Street. The West End, Oxford Street, Piccadilly Circus and all of the attractions of central London are within 15 to 20 minutes of the guest house. All of the rooms are en suite and equipped with modern facilities, including Sky satellite TV channels and shaver sockets. Free Wi-Fi wireless internet access is available throughout and a continental breakfast is included in the price. Ideally located next to the River Thames, the Tate Britain and the London Eye, this award-winning 4-star hotel combines stylish, contemporary design, luxurious modern accommodation and superb facilities. The City Inn Westminster combines a passion for modern design and innovation with an understanding of the needs of contemporary living. Each room has a newly installed iMac in-room multimedia entertainment system. This stylish and innovative system is both an entertainment system and a computer, allowing you to work or play. Surf the web; watch digital TV; listen to digital radio; play CDs and DVDs; or use it like an ordinary iMac. The stunning facilities include a critically-acclaimed restaurant, offering innovative European cuisine in stylish surroundings, and boasting an attractive open-air terrace. There is a well-equipped fitness room and 6 impressive private meeting rooms with state-of-the-art audiovisual and telecommunications equipment. Free wireless broadband internet access is available in all public areas. This 4-star hotel combines beautiful original Victorian architecture with contemporary style and modern comforts, including free Wi-Fi, air conditioning, iPod docking stations and power showers. The stylish Quality Hotel Maida Vale offers luxurious air-conditioned rooms, featuring MP3-player connections, minibars and flat-screen TVs with satellite pay-per-view channels. Rooms also have hand-built furniture, hypo-allergenic duvets and pillows, Egyptian-cotton bed sheets, Oxford pillow cases and orthopaedic mattresses. Every room is triple glazed, for warmth and quiet. The en suite bathrooms have designer power showers, steam-free mirrors and luxury toiletries and bathroom products from Elsyl. Rafkins Restaurant and Bar serves delicious Asian cuisine and has a live DJ in the evening and an open-plan kitchen, allowing diners to watch the food being prepared. 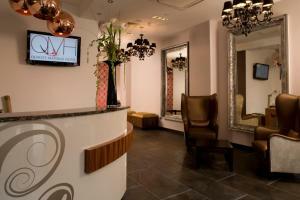 Guests receive a 30% discount at Macs hair and beauty salon. In the historic Bloomsbury district, this refurbished 200-year-old Georgian townhouse is now a family-run hotel offering free Wi-Fi and great-value en suite accommodation. 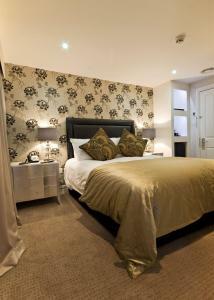 All of the rooms have small, compact en suite facilities and flat-screen TVs with Freeview digital channels. Free high-speed Wi-Fi wireless internet access is available throughout and there is also a computer in the guest lounge, available free of charge. A tasty and generous full English breakfast is included in the price. With a great location in the heart of London, the hotel is within easy walking distance of many famous London landmarks, including the British Museum, the shops of Oxford Street and London's famous theatres. The London Underground stations of Euston Square, Russell Square, Warren Street and Goodge Street are all nearby and Euston, Kings Cross and St. Pancras mainline railway stations are also within easy reach. Arosfa was once the home of the famous Pre-Raphaelite artist Sir John Everett Millais. Today it is a family-run hotel and great pride is taken in the quality, the cleanliness and the value it offers guests. The clean, modern, superior 2-star Leisure Inn Hotel is in a historic Victorian-style building. Hyde Park, Kensington Gardens, the Royal Albert Hall and V&A Museum are a short walk away. The reception is open 24 hours a day for flexible check-in. Staff can help arrange tickets for sightseeing tours and major attractions, or airport shuttles. Leisure Inn Hotel is convenient for shopping at Oxford Street and Kensington, including Harrods, as well as restaurants and entertainment. There are excellent public transport links to the City and attractions; the Planetarium and Madame Tussauds are 3 stops from Bayswater Tube Station. A 5-minute walk from Victoria Station within the stylish and historic Belgravia district, this deluxe boutique hotel was transformed by a ?6 million refurbishment. Within 5 beautiful houses, the designer bedrooms at The Tophams Hotel have free internet access, minibars and flat-screen TV with DVD (films available). In a peaceful area, The Tophams Hotel is also close to the London Underground and buses at Victoria Station. Tophams is not far Buckingham Palace, with the West End, Knightsbridge, theatre district and major museums within walking distance. Access from all major airports is quick and easy. The Gatwick Express is direct to Victoria, whilst the Heathrow Express arrives in Paddington, a short taxi ride away. With many leisure facilities, this modern hotel is in Maida Vale, a lively residential district of North London, within easy reach of all London attractions. The London Marriott Maida Vale has a range of leisure facilities, including a large leisure club, with a gym and swimming pool. If you would prefer to explore the area, Maida Vale and St Johns Wood have canals, cafes and many exclusive shops. You may even see a famous musician strolling down to the BBC Radio 1 studios. 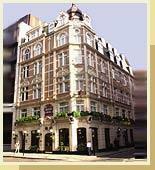 A short walk from the Underground, the London Marriott Hotel Maida Vale has easy access to Central London. Paddington Station is 4 stops away, with links to Heathrow Airport. This Marriott Hotel is outside the London Congestion Charge Zone. In central London, on a quiet street just metres from Marylebone Station, this 19th-century Georgian building is now a family-run hotel offering free Wi-Fi and light, comfortable rooms. 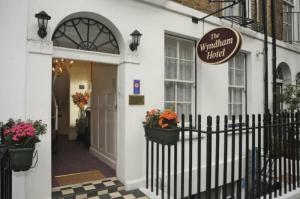 The Wyndham Hotel is within easy walking distance of many of London's major attractions. Marble Arch, Regent's Park, Hyde Park, Baker Street, Madame Tussaud's and the famous shops of Oxford Street are all less than a mile (1.6 km) from the hotel. The good location also means that the hotel offers easy access to London's public transport network and any part of the city is within easy reach via the London Underground or local buses. All of the bright, clean and comfortable rooms have TVs, fridges, hairdryers and telephones. Each room has a shower and a washbasin in the room, and complimentary toiletries are provided. A full English breakfast is available every day and there is a small, sunny courtyard through the dining room. Just 200 metres from Oxford Street, Tottenham Court Road London Underground Station and the Dominion Theatre, the hotel offers cosy, comfortable en suite rooms at great-value rates. Country Inns & Suites By Carlson has a superb location, close to all of the great shops of Oxford Street. Regent Street, Bond Street and all the theatres of London's West End are also within easy reach. The British Museum, fashionable Covent Garden and Piccadilly Circus are just half a mile (800 m) away. Situated on the Central line and the Northern line of the London Underground network, Tottenham Court Road London Underground Station offers fast, convenient transport all around London. The hotel combines an excellent city location with country charm throughout, with real fireplaces hardwood floors and the personal touches of home. All of the rooms have satellite TV, telephones, tea/coffee and work desks.